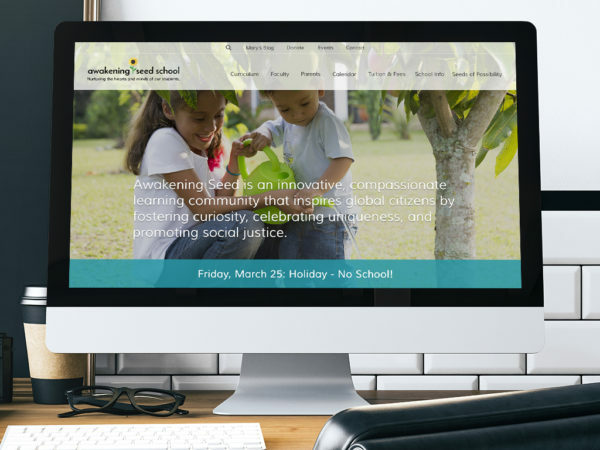 Awakening Seed is an environmental elementary school in Phoenix that came to us with a static website full of disorganized, outdated content. In order to communicate effectively with current and potential families, they knew they needed something better. Website. We designed built an entirely new site showcasing the school’s value and character, a site designed for intuitive navigation and search engine optimization. We used original photos and videos to create a highly visual experience that captured the school’s personality. Content. We worked with the school’s staff to filter and freshen older content about the school’s curriculum, mission statement and staff pages. We also created a video header from original video of the school’s students that brought the site to life. Video. It was important that the new site convey authenticity, and what better way to do that than a highly engaging video of actual students at the school? Using video shot by the school’s director, we created a video header featuring children at play that can’t help by draw the audience in. Call us today to learn how we can redesign your website and repurpose your content to refresh your brand. 651.357.4174.